We hope your New Year is off to a great start! January is the time for new beginnings, but also unfortunately marks the end of many summer holidays. This combined with the start of the new school year results in fairly expensive flight prices at the start of the month. Schools resume on the 9th of January 2018, after which flight prices become more affordable on most routes. Budget-conscious travellers should look at flights departing after the 14th if possible, as flights on most routes are more affordable after that date. The end of January is the perfect time to enjoy the summer weather and smaller crowds if you plan on heading to the beach. Find the cheapest dates to travel on each route below as highlighted in green. Mango JHB to CPT : Wednesday flights are a good option for budget-conscious travellers. Mango CPT to JNB : Affordable flights are more readily available after the first week of the month. Mango Lanseria to CPT : Flights are slightly more affordable during the second week of January, with the 7th being the cheapest day to travel on. Mango CPT to Lanseria : Thursday flights are slightly more affordable than travelling during the rest of the week. Mango JHB to Durban : Avoid travelling over weekends where possible and rather travel on dates highlighted in green if you can. Mango Durban to JHB : Sunday flights are some of the most expensive this month, so rather travel mid-week if possible. Mango Durban to Cape Town : Try to avoid flying on the dates highlighted in pink as those are by far the most expensive dates to travel on. Mango Cape Town to Durban : Affordable flights are more readily available from the 9th onward, when the school semester has started. 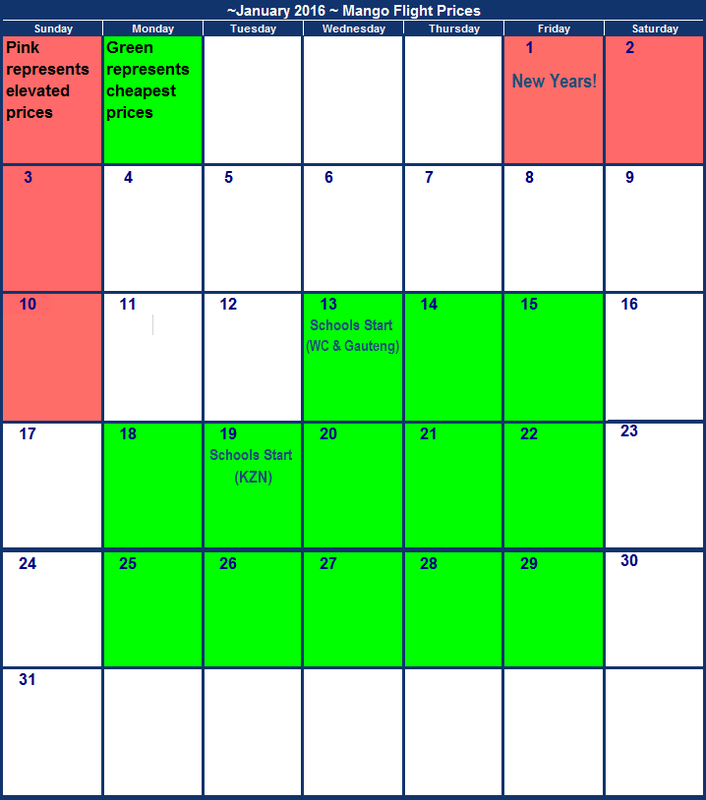 Mango JHB to George : If you are on a tight budget, try to travel on dates highlighted in green as those are by far the most affordable travel dates. Mango George to JHB : If possible, try to avoid travelling on dates highlighted in pink. Mango CPT to Bloemfontein : Be budget friendly and travel on the 23rd or 30th to save up to R1600! Mango Bloemfontein to CPT : If possible, travel towards the end of the month or after the 13th of January 2018. *Compiled on the 11th of December 2018. The beginning of a new year always simbolises a clean slate, the opportunity for new and exciting things and a time to let go of the past. Some might even find it intimidating! Luckily this handy price guide can help you choose the most budget friendly flights, as January isn't necessarily the easiest on our pockets. If you can avoid travelling before the school holiday ends on the 17th, you can easily save yourself a few Rand that could be repurposed for the purchase of thos pesky school supplies. If you do find yourself in need of a flight early in the New Year, the 1st of January often delivers some affordable options. Just be sure to keep the NYE drinks to a minimum or alternatively keep things simple and don't sleep this year! Mango JHB to CPT : If possible try to book flights after the first half of the month, when the school semester has started. Mango CPT to JNB : Try to avoid flying on the 2nd or 3rd when flight prices are more than double that of the previous month. 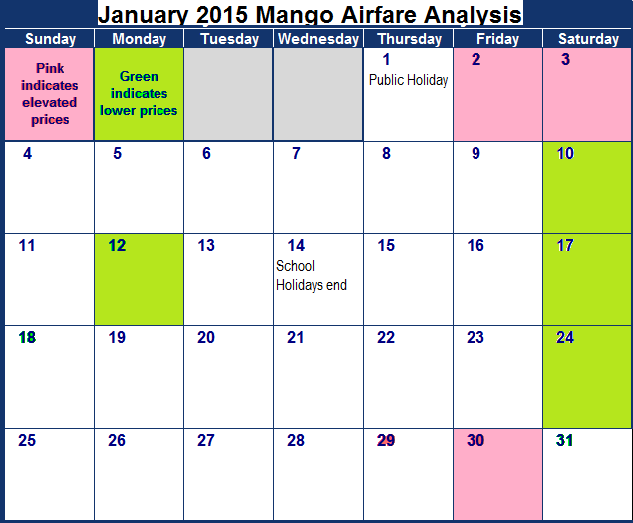 Mango Lanseria to CPT : Look out for dates highlighted in green if you are travelling on a budget. Flights on those dates are less than half the price of the flights on the 26th. 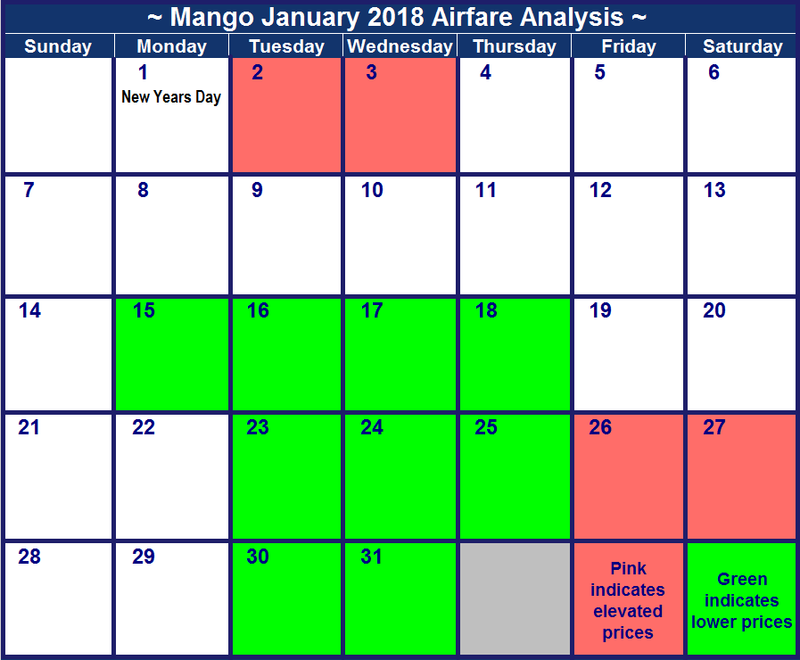 Mango CPT to Lanseria : If you have to be up in Joburg during January then try to head up at the end of the month to get access to the lowest airfares. 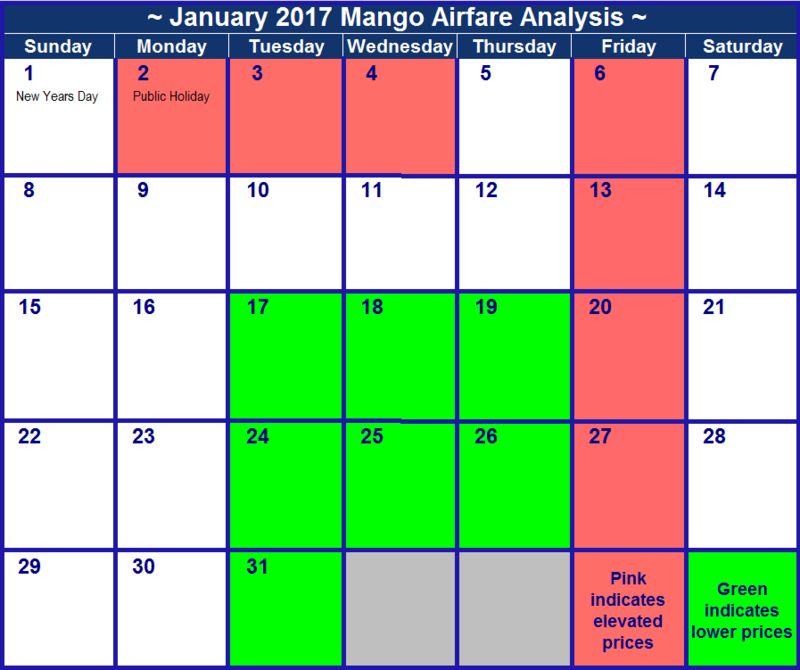 Mango JHB to Durban : Make the best of the cheap flights dotted throughout the month by booking flights on a date highlighted in green. Mango Durban to JHB : Sunday flights are the most expensive on this route, although not by much. In general flights are very affordable. Mango Durban to Cape Town : Try to avoid flying during the first two weeks of the month as well as the dates highlighted in pink. 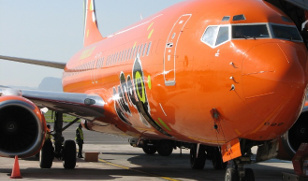 Mango Cape Town to Durban : Affordable flights are more readily available from the 16th onward. Mango JHB to George : Surprisingly this route's pricing bucks the trend, with the first week being the best week to travel budget wise. Mango George to JHB : Flights become more afforable after the schools resume on the 17th of January. Mango CPT to Bloemfontein : Be budget friendly and travel after the 15th to save up to R1400! Mango Bloemfontein to CPT : If possible, travel towards the end of the month on Mondays, Tuesdays and Wednesday. January is always a difficult travel month, as everyone needs to return home some time before the schools start or office hours resumes. As these dates are typically the same or similar for everyone, demand is high and prices skyrocket! What this survey does prove however is that the further in advance you book, the better airfares you can score! At the momement the only dates you'll have to avoid appears to be the first week of the New Year - but we're sure that will change soon, as schools only resume on the 11th, meaning the second week will soon also join the ranks of incredibly expensive flights. So happy booking and enjoy the great fares whilest they last! Mango JHB to CPT : Prices fluctuate quite a lot on this route during Jan. Try flying at the end of the month as prices decrease as the month ends. Mango CPT to JNB : Mango flights will soon be sold out on the 2nd and 3rd (as history tells us) but prices start improving from 9th and onwards. Mango Lanseria to CPT : Avoid travelling during the first week of the New Year as prices are incredibly inflated during this period. Mango JHB to Durban : Fridays are the most expensive days of the week to travel on, so try and kick-start your weekends a little earlier to save. Mango Durban to JHB : Flight prices start decreasing after the first week of the month. Mango Durban to Cape Town : Try to avoid flying on a Friday, Saturdays are good! Mango Cape Town to Durban : Try and fly on a Thursday during the end of the month if you have to get to Durban from CPT during January. Mango JHB to George : Surprisingly this route's pricing breaks the trend, with the first week being the best week to travel budget wise. Mango George to JHB : Budget conscious travellers will want to fly on weekdays after the 19th to save. Mango CPT to Bloemfontein : Be budget friendly and travel after the 15th to save up to R800! Mango Bloemfontein to CPT : The only dates to avoid travelling this month are the 26th and 27th. January is considered a busy travel month all over the world, add to that the fact that it is high summer and school holidays in South Africa and the expensive flight prices start to make sense. New Years and the end of the school holidays trigger even more expensive flights on the 1st, 2nd, 3rd and the 10th of January 2016. If it is affordable flights you are after, you'll have better luck travelling during the second half of the month. The prices below were the cheapest we could find on the 27th of December 2015 for each day in January 2016. Please remember that the more time that has passed since we set up this survey, the more likely it is that prices might have changed. The same can also be said for prices that were sourced very close to the departure dates, as availability changes. For the most current airfares please visit Mango.co.za. Mango JHB to CPT : Book after the 10th if possible, as flight prices are less than half that of the beginning of the year. Mango CPT to JNB : Mango flights are sold out on the 3rd and the 10th, but at least you can still book a flight back before school starts. Mango Lanseria to CPT : If possible travel on the 11th, 12th or 13th when flights are the most affordable. Mango CPT to Lanseria : Travel after the school year has kicked off, to save big on flights! Mango JHB to Durban : The Mango Happy Day sale ensures that flight prices are incredibly affordable from the 11th of January 2016. Mango Durban to JHB : Once again the second-half of the year is the most affordable time to travel. Mango Durban to Cape Town : If possible, avoid travelling before the 10th of January 2016. Mango Cape Town to Durban : Save on travel expenses if you travel between the 19th and the 30th of January 2016. Mango JHB to George : If you can avoid travelling within the first two weeks of the New Year, you can save big on flights between Johannesburg and George! Mango George to JHB :This highly popular route has sold out on a few popular travel dates, so prices are understandly expensive. Avoid travelling on the 2nd, 8th and 12th if possible. Mango CPT to Bloemfontein : Avoid travelling on the 1st, 10th and 12th when travellers are returning for school and work if possible. This will save you 100's! Mango Bloemfontein to CPT : Travelling between the 12th and the 28th of January will be the easiest on your pocket due to the Happy Day sale. January sees kids going back to school and parents going back to work after the traditional festive season break. With people heading back home from the 1st to the 14th of January, as school starts again on the 14th, prices are elevated over this period. People head to the coast for some fun in the sun over the hot month of January and this also raises airfares. If you feel like taking a break after spending almost a month with the kids then try flying in the middle of the week as prices are lower during the week. The prices below were the cheapest we could find on the 27th of October 2014 for each day in January 2015. Please remember that the more time that has passed since we set up this survey, the more likely it is that prices might have changed. For the most current airfares please visit Mango.co.za. Mango CPT to JNB : Mango flights are sold out on the 3rd and the prices are lower on Fridays, great thing if you're looking to travel over the weekend. Mango Lanseria to CPT : Try travelling in the beginning of the month as prices are the lowest in the beginning of the month. Mango JHB to Durban : Prices are very competitive during the whole month, try flying during the week though. Mango Durban to JHB : Looks like you're going to pay around R783 if you are looking at travelling during the week. Try not to fly on a Friday as prices are at their highest on a Friday. Mango JHB to George : There are 4 flights a week on this route, airfares are cheaper during the middle of the week. Mango George to JHB : Prices are at their highest during the beginning of the month with airfares dropping to the end of the month. Mango CPT to Bloemfontein : The highest airfare we found was on the 4th with prices from Monday to Wednesday being the lowest. Mango Bloemfontein to CPT : Tuesdays have the lowest airfares with Sunday the 4th having the highest. Mango Cape Town to PE : Prices are again highest on Fridays but surprisingly they are lowest on a Saturday. So if you want to fly from CPT to PE then fly on a Saturday. Mango PE to Cape Town : Prices are lowest on a Saturday. The 4th has the highest airfare of the month.